The nature of mold allows it grow on nearly any and every surface. Seemingly minor mold growth can be worse than it appears, and it can quickly develop into a serious and expensive contamination. Neglected mold growth could be leaving you, your family, and your home vulnerable to the dangerous side effects of mold. Mold can release mycotoxins that are potentially toxic to you and your family. The water damage stimulating the mold growth will diminish the structural integrity of your home. Mold should be addressed promptly by a certified NJ mold removal professional. MasterTech inspectors are thoroughly trained and certified to accurately report on your specific mold situation. Through the use of moisture meters, thermal imaging readers, and mold testing, our inspector will be able to safely diagnose your mold problem and prescribe an appropriate mold remediation plan. MasterTech always has you and your family’s safety and best interest in mind. Our team is committed to providing the safest and most effective mold remediation in Cinnaminson NJ. We have made every effort to strategically integrate the safest and most up-to-date mold removal tools, techniques, and research into the development of our step-by-step mold removal and remediation process. There are 3 core priorities to a proper mold remediation: identifying the source, containing the problem, and thorough cleaning and disposal. Identifying the source– In order to ensure the success of a mold cleanup, the source of issue must be resolved. Typically, at the end of a long moldy trail, there is a significant water or moisture source promoting the mold activity. Finding, stopping, and fixing the source of the water intrusion should be top priority. Containing the problem– Before beginning any work, it is important to carefully protect the unaffected areas. Technicians should be fully trained to carefully isolate all areas of concern with the appropriate barriers and covers to reduce the risk of cross-contamination. Cleaning and disposal– Usually, mold can be effectively removed from the surface of building materials without the use of toxic agents. However, in some severe cases of mold, some building materials may be non-salvageable. 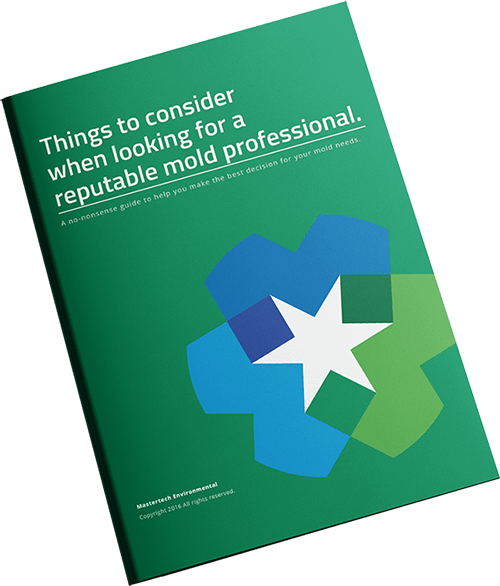 Mold technicians should be trained in the most advanced techniques for the safe, effective, and efficient removal and disposal of non-salvageable, mold-infested building materials. To ensure the utmost quality control, MasterTech will always conduct a post-remediation inspection and testing to confirm that we did the just right the first time and did not overlook any details. Additionally, each MasterTech mold removal in Cinnaminson, NJ is backed by our 5-year mold-free warranty. It is our promise that the mold has been properly removed, and it will not come back. The first sign of water intrusion is usually water staining or efflorescence. Efflorescence is the white, powdery substance that develops on the foundation wall surface. It is the result of water or vapor seepage which forces soluble salts and minerals to the surface. While efflorescence is not mold, but it is a sign of water or moisture seepage which can cause mold. If you are detecting signs of mold growth or if your Cinnaminson, NJ basement has a history of moisture problems, you should contact a certified basement mold removal professional in Cinnaminson, NJ to have your basement inspected. Most crawl spaces contain perfect conditions to support mold growth. Porous building materials and poor building envelope design play a huge role in most crawl space mold in Cinnaminson, NJ. Many crawl spaces are poorly vented with undersized wall vents. Although this seemed like a great idea years ago when they were introduced and added to the construction code, they have made moisture and mold issues worse. In spring and summer, crawl space vents introduce warm air into cool crawl spaces causing condensation on wood and masonry building materials. The same effect happens during cold seasons – only in the opposite order. If you discover mold in your crawl space, contact a crawl space mold removal company in Cinnaminson, NJ. The combination of heat and poor ventilation can cause Cinnaminson, NJ attic mold. If not properly ventilated, moist air gets trapped and infuses itself into the attic sheathing and rafters. This moist air can also increase airborne mold spore levels which can settle into insulation and on belongings stored in your attic. Proper attic mold remediation in Cinnaminson, NJ ensures that the mold problem is safely removed without cross-contamination to inhabitable areas below during cleanup. Our attic mold removal process also minimizes or eliminates dark staining left behind by moisture. We are fully licensed and insured in New Jersey, Pennsylvania, and Delaware for mold testing and remediation and offer a 5 year warranty. All our technicians are certified through the IICRC and ABRA to ensure that they do the job correctly. Our technicians are also licensed and certified to clean up bio hazard/hoarding conditions. MasterTech offers 24/7 response for emergency water, crime and death scene cleanup. MasterTech Environmental is an A+ rated BBB Accredited Company and Angie’s List Super Service Award Winner (2013, 2014, 2015). We are featured on and trusted by HGTV and DIY Networks. Do not let minor signs of mold growth fool you. The nature of mold allows it to spread rapidly and without notice. If you think you might have a mold problem in your New Jersey home or business, call MasterTech today to schedule mold inspection in Burlington County, NJ. For mold inspection and mold removal in Mount Holly, NJ or mold inspection and mold removal in Chesterfield, NJ, call 609-948-8844!